cleaning hack: I have a Monica Geller closet. Okayyyy, some true confessions here: I have a Monica Geller closet. If you've watched the t.v show Friends you'll know what I'm talking about. If you haven't watched it then go, watch the show (all ten seasons of it! ), and then come back and read this post. Because watching Friends (only one of the best shows ever) is so much better than any old thing I have to say. If you HAVE watched Friends then you know what I am talking about. I get lots of questions about my house, my cleaning routine, and what to do to keep the it tidy (which is not at all true, since most of the time it's a wreck) and I have one simple answer. I have a CLOSET. The Closet is in the guest room and it's huge (about twice as big as a normal closet). In that closet I keep all everything in life that I have, but don't know what to do with. Baby beds, clothes that aren't in season, baby clothes that Adri outgrew but don't fit Piper yet, extra bedding, Christmas decorations, old costumes, an air mattress, and toys that I'm trying to get Adri to forget so I can toss them out (yes, I'm the world's best mom). Since moving here to this house a little over a year ago I've cleaned that closet out a grand total on one time. Yup, you heard right. ONE time. There's so much stuff in there. Like, SO MUCH STUFF (I had to write that in all caps to get the point across). 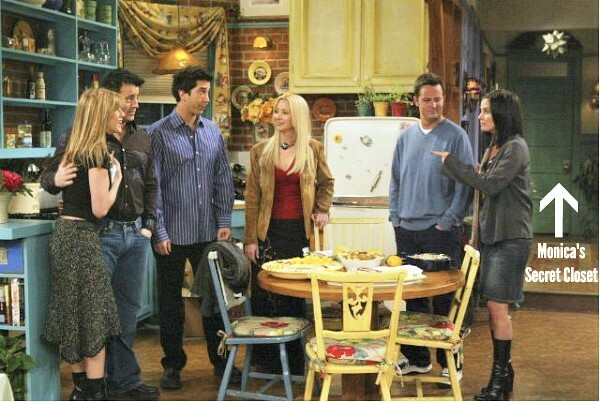 I think I've found that the happy medium to having a tidy house is to have one place in it that is a complete disaster, and I have Monica to thank for that. p.s did you think you were going to see a photo of my closet? Sorry to disappoint, but no. Just no. I have storage shelves in my basement that handle this kind of thing. Storage makes a huge difference in a clean house vs a cluttered house. My son and his wife are in a mobile home with no storage! Thankfully my parents have space for them to store stuff long term! I have watched some Friends episodes, but I've never seen Monica's closet. I'm intrigued! A place like that does make a big difference in the look of the home. I don't have one big closet, but rather little tucked away corners/drawers -- one on each floor of the home. It is freeing!